I know the is eagerly anticipated because I have folder of email enquiries I can now respond to. Registration for the 20th Cambridge MedChem Meeting is now open !! In many companies/institutions/universities new arrivals are presented with a variety of desktop tools with little or no advice on how to use them other than "pick it up as you along". This workshop is intended to provide expert tutorials to get you started and show what can be achieved with the software. The tutorials will be given a series of outstanding experts Christian Lemmen (BioSolveIT), Akos Tarcsay (ChemAxon), Giovanna Tedesco (Cresset), Dan Ormsby (Dotmatics) Greg Landrum (Knime ) and Matt Segall (Optibrium), you will be able to install the software packages on you own laptops together with a license to allow you to use it for a limited period after the event. Registration opened just before Christmas and apparently there were a number of people sign up over the festive period. Remember there are a limited number of places and it is first come first served. Registration and full details are here. I'm delighted to report that over 200 people have now watched the video online, looks like it was a valuable resource. One of the nice things about my job is I get the chance to take part in some truly inspiring events. Last month I had the honour of chairing a session on Neglected and Tropical Diseases at the 19th Cambridge MedChem Meeting. In an effort of extend the exposure of the brilliant science undertaken in this important therapeutic area the conference organisers arranged for this to be a live webinar. The session was also recorded and is now available online. Please feel free to share. #19thCamMedChem. This Award was founded in 2002 in memory of the chemists Nigel Capps, Richard Green and Alex Zomaya to recognise outstanding contributions to medicinal or computational medicinal chemistry. The winner will be chosen by an independent panel of senior chemists, selected by the Committee of the RSC Biological and Medicinal Chemistry Sector (BMCS) and the Capps Green Zomaya Trust. 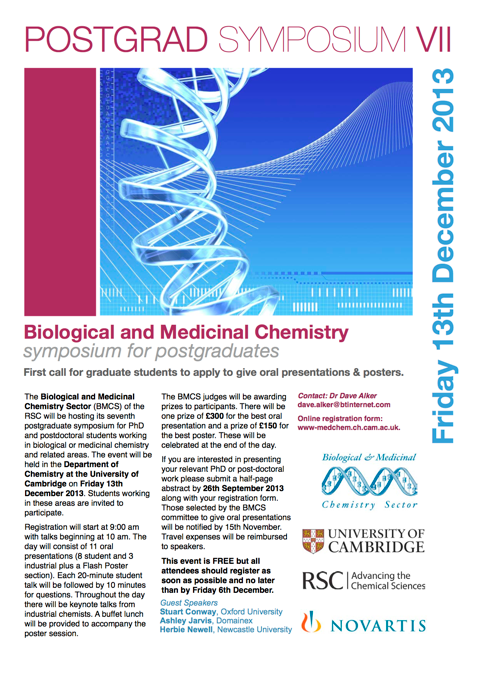 The Biological and Medicinal Chemistry Sector (BMCS) of the Royal Society of Chemistry will be hosting its 11th postgraduate symposium for PhD students and postdoctoral workers researching in biological or medicinal chemistry and related areas. The event will be held in the Department of Chemistry at the University of Cambridge on Friday 8th December 2017. Researchers working in these areas are invited to participate. Registration will start at 9:00 am with talks beginning at 10:00 am. The day will consist of 11 oral presentations (8 student and 3 keynote) plus a Flash Poster section. Each 20 minute student talk will be followed by 10 minutes for questions. This is a fantastic meeting for anyone interested in medicinal chemistry and drug discovery, this event is FREE but all attendees should register as soon as possible and no later than the 1st December 2017. I've been a tutor at the RSC MedChem School on a number of occasions and I can say this is an excellent opportunity for scientists new to drug discovery to benefit from an understanding of all aspects of the drug discovery process, from target and hit identification, through ADME and computational chemistry, to patents and safety studies. The 2017 Medicinal Chemistry Residential School takes place 11 - 16 June, Loughborough UK, it is always very popular so well worth signing up early. The 2017 Residential School will take place over 5 days and content is delivered by experts in the field from industry and academia. The programme includes lectures focusing on the fundamental principles of drug discovery, hands-on tutorials allowing delegates to put into practice what they have learnt and case histories from previous drug discovery projects. The programme will also include an evening lecture from a distinguished speaker. Throughout the week course tutors and speakers will be available for informal discussion and there will be plenty of opportunities to network with the broad range of academic and industrial researchers in attendance. Fragment-based screening is now a well established methodology for the identification of leads for drug discovery and the aim of the 6th RSC-BMCS Fragment-based Drug Discovery meeting will be to continue the focus on case studies in Fragment-based Drug Discovery that have delivered compounds to late stage medicinal chemistry, preclinical or clinical programmes. Full details and registration are online. The Royal Society of Chemistry celebrates it's 175th anniversary in 2016. I thought I'd contribute to the activities by highlighting "Molecule 175" from various databases. First up ChemSpider a free chemical structure database supported by the Royal Society of Chemistry providing fast text and structure search access to over 40 million structures from hundreds of data sources. ChemSpider ID 175 refers to acetone, a very important solvent with millions of tonnes produced annually. Next ChEMBL a database of over 1,7 million small molecules and associated biological activity data. ChEMBL175 is Dexibuprofen, this is the active enantiomer of ibuprofen, a well known non-steroidal anti-inflammatory drug. Drugbank is a richly annotated database of drug and drug target information. 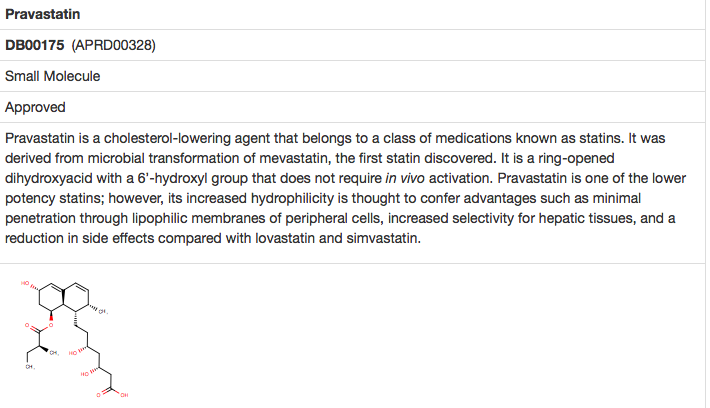 DB00175 is Pravastatin a HMG-CoA reductase inhibitor used as a cholesterol-lowering agent. Pubchem released in 2004, provides information on the biological activities of small molecules. Pubchem CID175 belongs to acetate, the ionised form of acetic acid, Acetate is the most common building block for biosynthesis. BindingDB is a public, web-accessible database of measured binding affinities, focusing chiefly on the interactions of protein considered to be drug-targets with small, drug-like molecules. 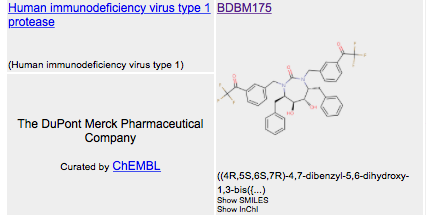 BDBM175 refers to an inhibitor of HIV protease designed to take advantage of the C2 axis of symmetry found for this dimeric protease. Zinc is a free database of commercially available compounds ideal for virtual screening, entry 175 appears to be a hydrated form of the benzodiazepine Clorazepate. 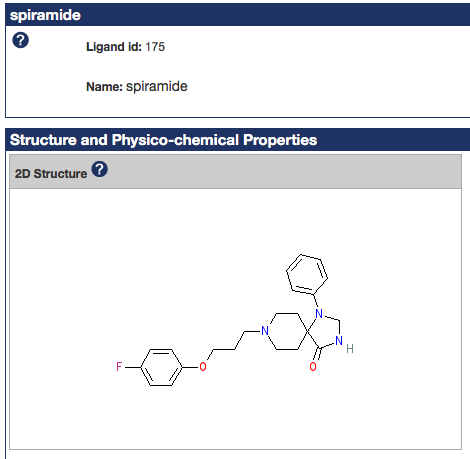 In the IUPHAR/BPS Guide to PHARMACOLOGY entry 175 is Spiramide, a 5-HT2 antagonist. I just got details of an interesting meeting in Cambridge, UK later this year. 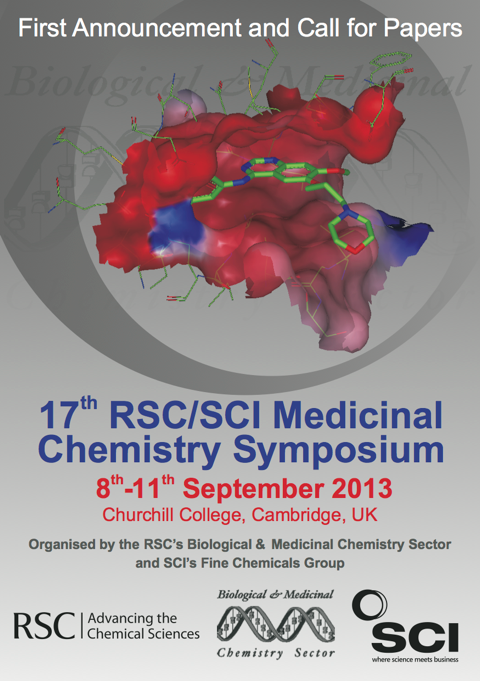 The registrations are coming in for the forthcoming 17th RSC/SCI Medicinal Chemistry Symposium to be held in Cambridge UK (8-11 Sept 2013). Book early to avoid disappointment. Full details of the scientific programme are available here together with the registration form. 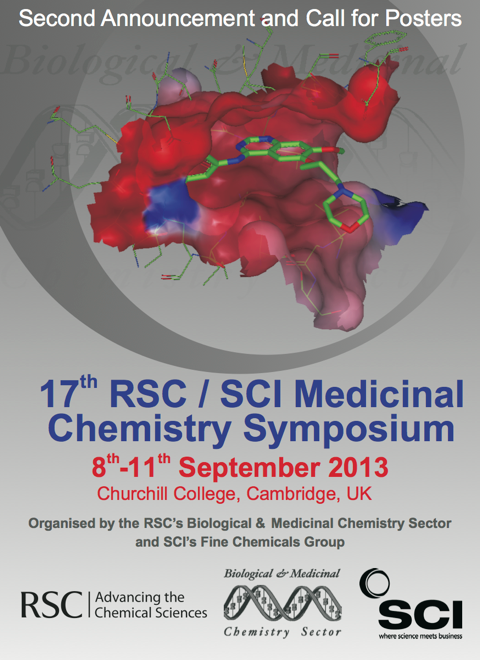 The latest details of the forthcoming 17th RSC/SCI Medicinal Chemistry Symposium to be held in Cambridge UK (8-11 Sept 2013) are now available. The first circular for the 17th RSC/SCI Medicinal Chemistry Symposium is available for download. The meeting will be held at Churchill College Cambridge UK, 8-11 September 2013. Always a hugely popular meeting so worth registering your interest early. The deadline for the early bird rates ends soon for the 16th SCI/RSC Medicinal Chemistry Symposium to be held Sunday 11 -14 September 2011 Churchill College, Cambridge, UK. 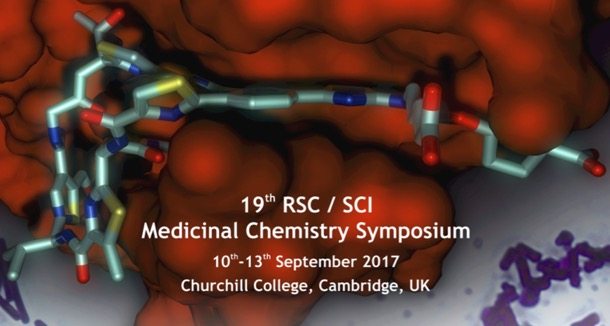 The 16th SCI-RSC Medicinal Chemistry Symposium will focus on first disclosures and new strategies in medicinal chemistry. Reflecting current trends in medicinal chemistry and pharmaceutical research, the theme of the conference will be The Path Forward: Collaboration or Competition? The scientific programme features lectures on Enzyme Inhibitors, Ligands for Receptors and Ion Channels plus a Hot Topic late breaker session. In addition the meeting has a number of talks addressing key Enabling Processes and Technologies for the future of Medicinal Chemistry. There will also be Poster Sessions with a number of posters selected for short talks. The details of the RSC MedChem School that will be held 4-8 July 2011 at Burleigh Court Conference Centre, Loughborough University are now online. Early bird registration is available until April 1st. Full details can be found on the RSC website here. The residential training school focusses on current thinking in drug discovery and will take place at the Burleigh Court Conference Centre, Loughborough University. The course is directed primarily at graduate and post doctoral chemists with 1-4 years experience in the field of drug research. Final year PhD students in pharmacy and organic chemistry contemplating a career in medicinal chemistry will also find the course of use. Contributions from the whole field of medicinal chemistry are invited. Please submit A4 abstracts of your poster presentation to jacqui.colgate@soci.org and indicate whether you are willing to be upgraded to a poster talk. Deadline for submissions: 27 May 2011. The RSC Medicinal Chemistry Summer School, for the last 40 years regarded as the pre-eminent industry training course for medicinal chemists, is due to take place 4-8th July 2011 at Burleigh Court Conference Centre, Loughborough University. It brings together cross-industry and cross-discipline practitioners to provide lectures, tutorials , workshops and case-studies illustrating modern drug discovery. 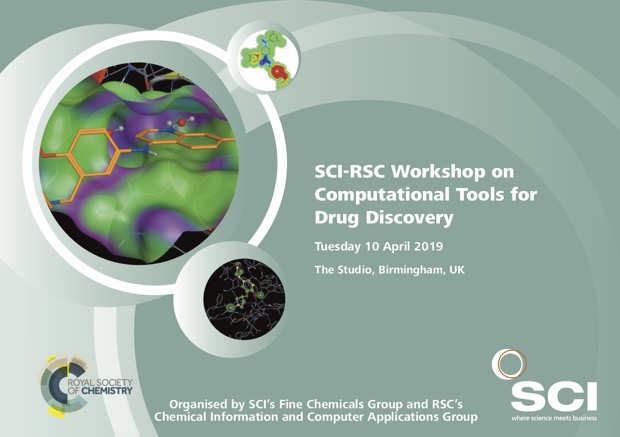 This will provides an excellent training opportunity for young medicinal chemists, a refresher for those more experienced, or an introduction to drug design thinking for any scientist working in cross-functional discovery teams. The flyer and application form can be downloaded here. The first circular for the 16th RSC-SCI Medicinal Chemistry Symposium, 11-14 September 2011, Churchill College, Cambridge, UK is now available here.